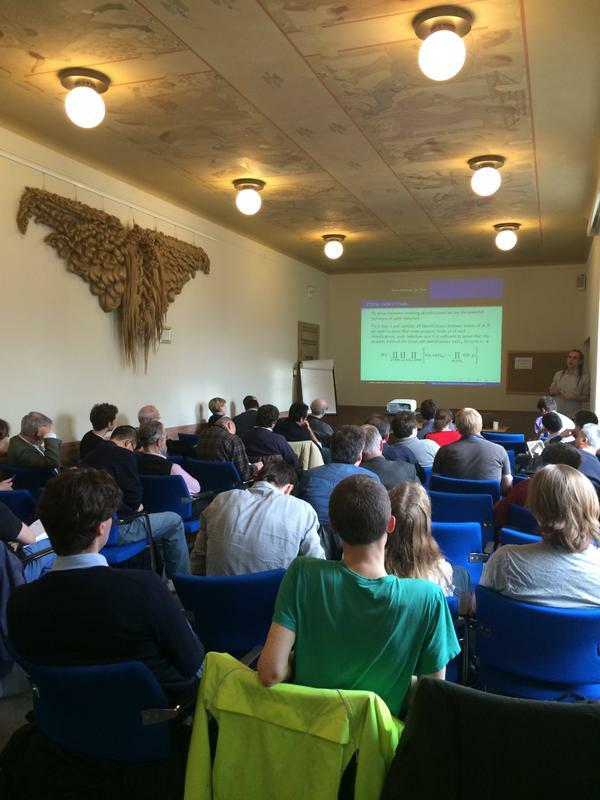 The Second Symposium on the Foundations of Mathematics was held at Senate House, University of London, from the 12-14 January 2015. The event was successfully advertised through the organising team’s network of contacts, including online mailing lists and blogs, local, national and international philosophy department mailing lists, and the Symposium’s dedicated website. Extensive advertising for the event resulted in approximately 40 participants. The event focused on different approaches to the foundations of mathematics, and built on themes discussed at the First Symposium on the Foundations of Mathematics, held in July 2014 at the Kurt Gödel Research Center, University of Vienna. Talks on the first day, by James Ladyman (University of Bristol), David Corfield (University of Kent), and Dimitris Tsementzis (Princeton University) focused on category-theoretic approaches to the foundations of mathematics. There was particular emphasis on cutting edge research in Homotopy Type Theory, an emerging foundations programme that has been hailed as a strong alternative to traditional set-theoretic foundations. One of the main questions that arose from these talks was how it would be possible to compare category-theoretic and set-theoretic approaches as competing programmes in the foundations of mathematics. This question was directly addressed by Toby Meadows (University of Aberdeen), who gave the last talk of the day, and discussed a general framework for comparing different foundational programmes. Dr. Meadows’s talk led naturally into the second day of the conference, which focused primarily on recent work on set-theoretic foundations. Sy-David Friedman (University of Vienna) discussed his current project, the hyper-universe programme, which aims to find and justify new set-theoretic axioms in order to reduce the incompleteness of ZFC set theory (Zermelo-Fraenkel set theory with the Axiom of Choice). Shivaram Lingamneni (Stanford University/University of California, Berkeley) discussed the possibility of resolving the Continuum Hypothesis, a very natural set-theoretic statement that cannot be resolved by the ZFC axioms. Sam Sanders (University of Ghent / Munich Center for Mathematical Philosophy) gave a presentation arguing that predicativism, a limitative approach to arithmetic, justifies different resources dependent upon the acceptance of infinitesimals (a controversial but useful kind of mathematical object). Finally, the day was rounded off by Victoria Gitman (City University of New York) who explored different kinds of Choice principle (a natural mathematical principle) in the context of class theory, thus informing the debate concerning a philosophically and mathematically fascinating kind of entity linked to the very inception of foundations. Because of the outstanding quality of the contributed papers, the organisers accepted an additional paper from Benedict Eastaugh (Bristol), who presented the last talk on the morning of the third day. In this presentation, Benedict’s research on reverse mathematics was applied to the problem of discovering new set-existence principles. On all three days, there was ample time for lively and informal discussion at the organised coffee breaks, lunches and dinners. We were fortunate to have delegates from across the UK, Europe and the US to bring international perspectives on all of the topics discussed in the presentations. We anticipate that these informal discussions will lead to the development of research networks where these issues can be discussed in further detail. Given the high quality of all of the presentations, we plan to arrange for a proceedings volume to collect together a selection of papers based on the talks given at all of the Symposia on the Foundations of Mathematics. The most important conclusion to be drawn from the conference is that there is still a lot of work to be done in the foundations of mathematics. From the set-theoretic perspective, the search for new axioms, and how to justify them, is well under way. On the category-theoretic/homotopy type theory side, more work is needed to enable philosophers to understand and apply the methods used in these areas. And further work is needed to develop a framework within which we can compare these two approaches (and any others) in the foundations of mathematics. We hope to tackle these projects in further instalments of the Symposia on the Foundations of Mathematics. Based on the success of this conference in London, there are plans for two more Symposia. The next event will take place in Vienna, at the Kurt Gödel Research Center, in August/September 2015. And there are plans for a subsequent event to take place in Bristol during the Summer 2016. There has been an enthusiastic response to the idea of further events to continue these discussions.